Car camping, or van camping, is quickly becoming a popular alternative to RV travel. But what exactly is “car camping”? Well, it depends on who you talk to. To some, “car camping” means exactly what it sounds like- sleeping in your car. To others, car camping means that you pack all your camping gear in your vehicle and drive to your campsite, as opposed to backpacking to your campsite. Rather than sleeping in your car, you sleep in a tent. For clarity purposes, this post is about car camping in the more literal sense. Is it safe to sleep in your car? Who is best suited for car camping? The short answer is “Yes,” but you do need to be mindful of where you decide to park for the night. Rest stops across the country can be a great place to stop, stretch and get some rest, but not all welcome sleeping in your car. Only six states across the U.S. permit overnight stays. Do a little research on state highway websites before you embark on your trip, so you know where you can stop to sleep so you don’t run the risk of getting a ticket. Unless you see a sign posted otherwise, you are welcome to park overnight at most Walmart stores. If you pull into the parking lot and find other overnighters, it’s probably safe to say you’re free to stay but double check with the manager on duty. The reason for this is even though Walmart may not mind if park overnight, the city itself may have an ordinance against this and you could find yourself in an uncomfortable situation should a tow truck show up in the middle of the night. You’re likely to find a Walmart located along or near an interstate to be more welcoming to car camping than those located in or around a city. No matter where you find a spot to rest your head, be courteous to the store and park in an out of the way parking spot, but remain in a well-lit area for safety’s sake. Truck stops also allow overnight parking and offer services like Wi-Fi and showers. Keep in mind the trucks can be noisy, and you may not find the peaceful atmosphere you’re looking for. If you decide to go this route, pack a set of earplugs. While campgrounds should be a safe bet, not all campgrounds are going to allow you to just show up and sleep out of your vehicle. A quick phone call before you arrive will ensure you don’t find yourself out in the cold. Avoid pulling off the side of the road or parking in residential areas. Lock your doors and keep your keys handy. If you hear someone messing with your vehicle, you can always sound the alarm from your key fob. As with any overnight camping, use common sense. If you don’t feel safe, trust your gut and move on. That’s not a problem when you’re car camping. You don’t need to unplug anything or pack up a campsite, you can simply drive away. Unlike RV’s, camping in your vehicle does not require an additional investment. More than likely, you already own the vehicle you plan to use on your adventures. 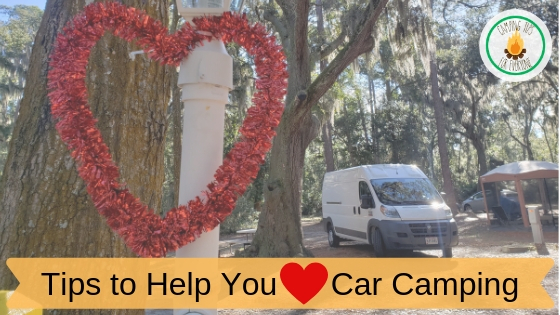 Cars, vans, and trucks are also able to navigate all main routes freely without worrying about size restrictions, low bridges, or parking that can be an issue for those traveling with motorhomes or travel trailers. Sleeping in your car is also more secure than sleeping in a tent and it’s very affordable. It saves you the cost of hotel rooms, so you can literally travel for the price of gas. 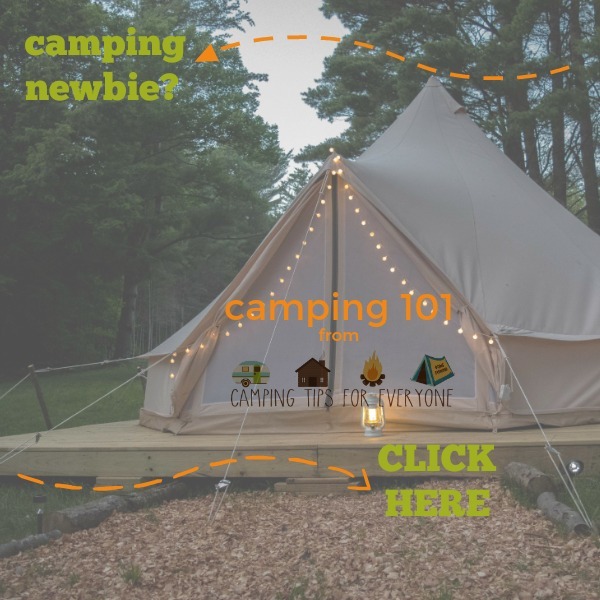 Camping in your vehicle is ideal for couples on a budget, adventurous solo travelers, or empty nesters who still enjoy the thrill of sleeping under the stars, but who may not enjoy crawling off the hard ground in the morning. When preparing for your car camping journey, you need to make sure that you don’t pack so much that there isn’t any room for you to sleep, but that you pack adequate supplies to camp in relative comfort. One reason car camping is so appealing is that unlike tent camping, there are very few items that are true car camping essentials, and you probably already own many of them. The ONE item that should be on your car camping checklist is an air mattress or camping pad followed by a pillow and blankets or a sleeping bag. If you don’t get a good night’s rest in your vehicle then sleeping in your car is not likely to be an activity you’ll enjoy or continue. An air mattress, sleeping bag or warm blanket, and pillow. A power inverter to charge your cell phone and laptop or camera if needed. Bins for organizing your gear. A portable Jump Starter in case you drain your battery. A vehicle. Seriously, if you’d like to start car camping but your current mode of transportation isn’t practical, rent a vehicle, or several, until you find one that works well for you and meets all the sleeping in your car needs. 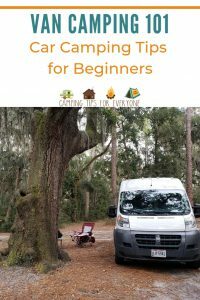 When it comes to car camping tips, perhaps the most important is to have a trial run before hitting the road for a weekend. Camp at home in your set-up to remedy any potential problems you encounter. Forget the suitcases and oversized duffel bags and opt for clear plastic bins or small backpacks to store your clothes and camping gear. They pack better and allow you to easily see what is in each bin. Pack a small bag with toiletries that you can easily grab to use in a rest stop or gym shower. Large SUV’s, trucks, and minivans provide plenty of leg space and room for gear, but all have their drawbacks. An SUV will have seats that may need to be manually removed to make room for your bed- unless you are traveling solo. Also, SUV’s and trucks use more gas than a typical minivan which may be important if you’re tight on cash. For both SUV’s and trucks, custom mattresses are available to fit around the wheel wells for a better fit and slight modifications may make the rig more car camping friendly. Some minivans are easy to convert with seats that slide completely into the floor making camping as easy as loading your car camping essentials and hitting the road. A cargo van with a high-top will likely offer the most space for storage and is ideal for those who are interested in taking their car camping up a notch. You may use them as is or do a number of customizations so they are essentially a compact RV tailored especially to your needs. Unless you crack a window, you will have condensation buildup on the inside of your vehicle. To combat this, tuck a package of DampRid inside your car. To ensure you have privacy, rig up some curtains. This can be as simple as hanging fabric with a bungee cord, to creating custom-made privacy curtains that Velcro or snap around your windows. Earplugs and an eye mask are a cheap investment if you’re a light sleeper to block out noises and light if you plan to overnight at Walmart or a truck stop. Pick up an inexpensive pair of flip-flops that you can easily slip on and off in the middle of the night in the event you need to venture out to the restroom. Speaking of restrooms, you likely won’t have one in your vehicle, so you need to hold it or find an alternative. If space allows, you can make a toilet out of a bucket, trash bags, and sawdust or kitty litter but this isn’t an option for most car campers. For those that can be flexible and enjoy adventure, car camping can be a wonderful way to road trip, allow you to travel inexpensively, and create memories to last a lifetime. Do you have any car camping tips that you’d like to share?